My good looking and comfortable G-2 but with the needle tip of the cooler ink cartridge. A nice typer! 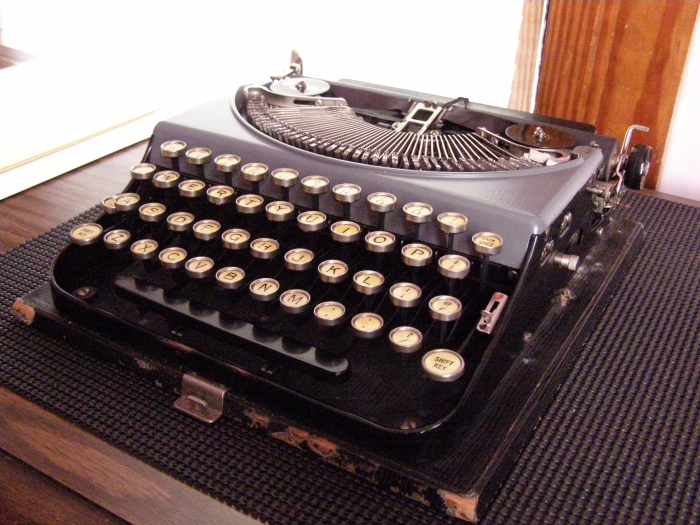 From the pictures, I'd say that it is a Remington Portable No 2. The decorative curved metal on either side of the type-basket gives it away. Glad to see it is working well for you. 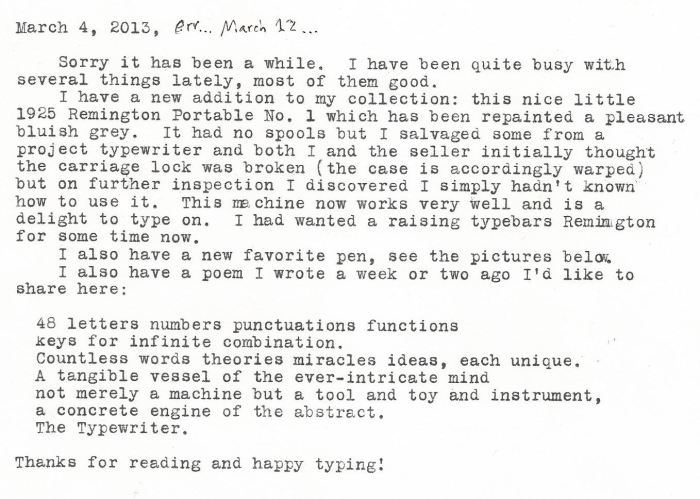 They are great machines; the geared typebar arrangement, in my opinion, is one of the greatest innovations in typewriters. It's a shame more machines didn't make use of it. So smooth, and nearly impossible to get a sticky key. Awesome! The serial is NL56237 which based on what I think I read in an article by Richard Polt suggested a late 1925 #1. I might have misunderstood, I read it in a hurry because I was eager to clean up the machine and begin typing with it. Congratulations! Making a video was a good idea. Ken is correct, it's a no. 2. Your machine was made in March 1925, and the no. 2 replaced the no. 1 in February 1925. Ok, so it is a super early #2 then, which is just as cool. Fine looking hardware! I remember when the Pilot Precise came out it was something special and still a top pen. Love those flat typebars though. And you can just see the "Home Portable" decal showing through the new paint. I really like the action but find the typing position a little upright. In that you have to look down more on what you are typing, not unlike carriage shift Imperial Good Companions. quality post! love the paint job and the pen! Congratz on your new machine! It's a beauty! And thanks for the video. I've never seen raising typebars in action before.